Here we have a flight of three Hurricanes climbing hard into the Summer sky of 1940. The lead plane is painted in the markings of Flying Officer Richard Lee of No 85 Squadron who was based at Debden, in Essex. Sadly, F/O Lee was killed while he was on patrol on the 18th of August 1940. 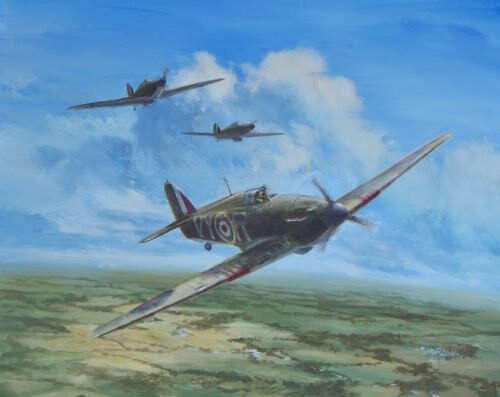 He was lost in his Hurricane MkI while chasing three Bf 109's off the coast, at 17:50hrs. He was aged 23.